I haven't blogged much in the past little while. Like so many others around me, I've been busy coughing and sneezing. What time I did have, I've been on a quest to finish up a few knitting projects. I have socks on my needles almost constantly. Fortunately, they aren't always the same pair! The mini-KAL I've doing with my friend is right on track. 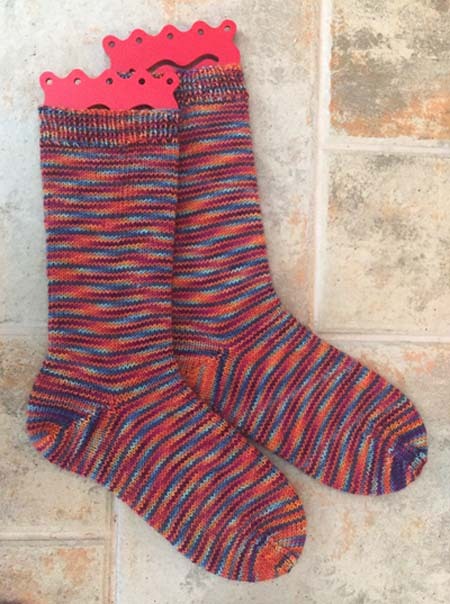 Last month I finished the April socks, just as the month was closing out. When these socks were done I was happy as they were getting to be a bit boring. The color has a lot of similarities to the socks from March and I was ready for a change. And change it is this month: the May socks are shades of purple. I'm also making a pair of socks in a bright orange. Subtle? I think not! Boring? Definitely not. Tomorrow I'm planning to blog about a sweater that I'm working on and my color decisions. I hope you'll come back. I'm open to suggestions.